Chances are pretty good that at some point or another, you have experienced shoulder pain. In fact, it’s one of the top three complaints we typically see here in our physical therapy clinic. It seems like everything from throwing and working overhead to even just sleeping on it wrong can cause some shoulder pain. So at what point do we need to be concerned that it’s serious? How can we differentiate between “shoulder pain” which will go away in 1-2 weeks versus something more serious like your rotator cuff? Well today Tyler Bluth, PT, MPT, sheds a little light on that subject. Read all about what it rotator cuff pain and what you should do if you suspect you might have it: Rotator cuff tendinitis is inflammation of tissues in the joint that helps move the shoulder. The shoulder is the most mobile joint in the body; as such there are a lot of muscles, tendons, bursae, and other structures that aid in mobility and stability. Occasionally these structures can get over-worked, irritated, and ultimately “pinched” one against another. Another name for rotator cuff tendinitis is called impingement syndrome. 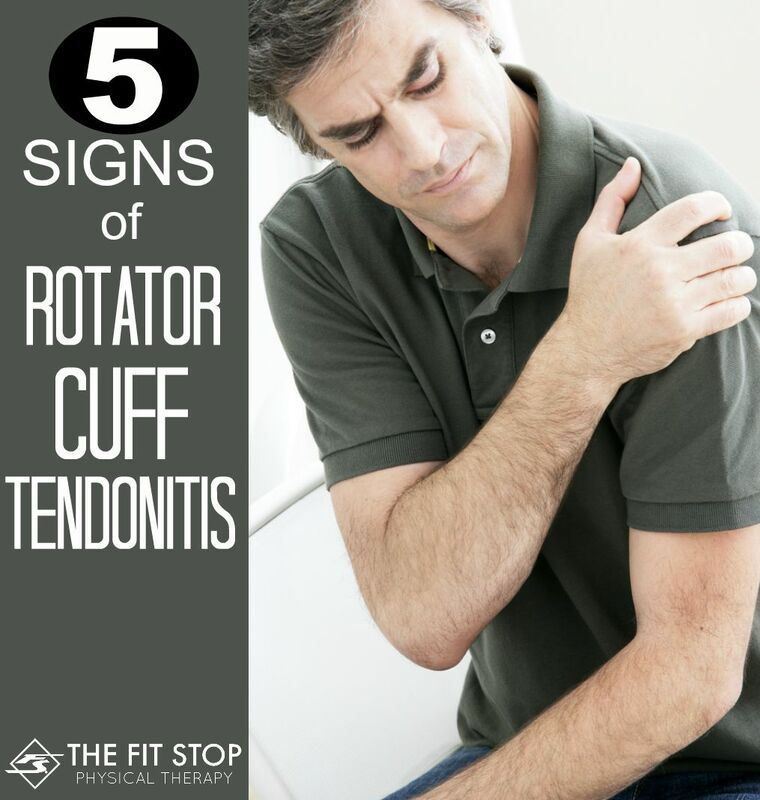 Tendinitis of the rotator cuff usually occurs over time from wear and tear. Athletes performing overhead and repetitive activities are usually the most susceptible to rotator cuff tendinitis; but it can also occur as we age and our body structure changes (posture, muscle mass, etc). Some tendinitis is caused by a certain event or injury (fall, trauma, etc). In most cases, however, athletes that participate in overhead activities (swimming, racquetball and tennis) are most susceptible to this type of injury. Granted this list isn’t all-inclusive, bu that gives you an idea of some tests that you can do at home to determine the extent of your shoulder injury. So how is a rotator cuff injury actually diagnosed? If you’re having symptoms of rotator cuff tendinitis your doctor will begin by examining your shoulder. He or she will check to see where you feeling pain and tenderness. Your doctor will also test your range of motion strength by asking to move your arms in certain directions, both without and without resistace. Your doctor may order imaging test such as an x-ray or MRI to determine the extent of the injury. Keep in mind x-rays are really good at visualizing bone and other hard tissue; soft tissue (muscle and tendon) is better seen with an MRI (which is also more expensive). Many times changing the activity that caused the pain in the first place will help the most. If throwing the ball is aggrivating, it’s a good idea to take some time off from throwing. Medication, such as anti-inflammatories may be used. It is important that the patient takes these medications for a prerscribed amount of time to get the result desired. This is a great option to chase away whatever inflammation you may be experiencing in your shoulder. In some more severe cases an injection of cortisone is effective in decreasing pain and inflammation in the shoulder. For more advice about what you can do for an acute shoulder injury check out this link! An important aspect of shoulder rehabilitation is not only moving, but moving properly. A physical therapist instructs patients in the proper exercises to improve strength and decrease inflammation. The shoulder joint, more than any other joint in the body, is designed to move. Strengthening activities such as theraband internal/external rotation and lifting a light dumbbell in different patterns can be helpful. Check out this post to read more about indicated shoulder exercises and the proper way to warm up prior to activity.